As a dietary food supplement, mix one serving of 5 grams (one level teaspoon) into at least 16 ounces (500mL) of water or other suitable liquid and drink within 15 minutes. Consume one serving per day. For best results, use this product as part of a proper diet and exercise program. Do not exceed recommended daily dose of 5 grams per day (one single dose). Food supplements should not be used as a substitute for a healthy and varied diet. Do not consume Qualitine powder without first mixing into at least 16 ounces (15mL) of water or suitable fluid. Drink plenty of water or other suitable liquid while using this product. Keep out of reach of children. Consult with a physician or your qualified health care provider before using this product or any other dietary supplement. Not for use in individuals under 18 years of age or in women who may be pregnant or who are nursing. Store this product in a cool, dry place away from direct sunlight. Keep bottle tightly closed. Mix one rounded scoop of Qualitine powder with 8 oz. water or your favorite beverage. KEEP OUT OF REACH OF CHILDREN. CHECK WITH A QUALIFIED HEALTHCARE PROFESSIONAL BEFORE USING THIS PRODUCT IF YOU ARE UNDER 18 YEARS OF AGE, PREGNANT OR NURSING A BABY OR IF YOU HAVE ANY KNOWN OR SUSPECTED MEDICAL CONDITION(S) AND/OR ARE TAKING ANY PRESCRIPTION OR OTC MEDICATION(S). DO NOT EXCEED RECOMMENDED DOSE. NOT TO BE USED AS A SUBSTITUTE FOR A HEALTHY AND BALANCED DIET AND ACTIVE LIFESTYLE. STORE IN A COOL, DRY PLACE. Qualitine from Gaspari Nutrition uses only 99.9%+ pure creatine monohydrate that has been micronized to insure instant dissolution into water or other suitable liquids. Qualitine is tasteless, odorless, crystalline and pure –qualities that are obvious from the moment you open the bottle and every time you use this elite product. Creatine monohydrate is perhaps the most studied dietary supplement in the Sports Nutrition industry. In the last two decades it has become a “must have” product in virtually any and every athlete’s arsenal to insure maximum muscle size and maximal muscle strength. Over 200 scientific studies have been conducted at universities and independent testing sites around the world clearly testifying to the safety and effectiveness of this ingredient. Both The American College of Sports Medicine (ACSM) and The International Society of Sports Nutrition (ISSN) have authored and published consensus, position papers regarding the effectiveness of creatine supplementation. 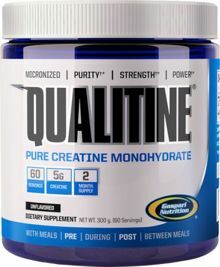 Hundreds of university professors, sports medicine physicians and athletic trainers agree that creatine monohydrate is perhaps the single most effective dietary ingredient available in the Sports Nutrition market today.